What is it about dreams that make them so unbearably cinematic? Perhaps it’s the chase, the song and dance of it. The grandiosity, vividness. Or its proximity. How close it seems once we’ve projected the idealized versions of ourselves in the cinema of our subconscious. I suppose the real question is what makes us want to chase our dreams when the world tells us otherwise. When we’ve faced rejection, tasted failure. How long do we go on chasing something until we realize we’re just making a fool of ourselves? Such is where we find Mia and Sebastian, in the middle of a traffic jam, Mia rehearsing lines in her car, Sebastian committing piano lines to memory, their careers going nowhere. It could be so easy to judge them, but in the sprawl of LA, a city full of people desperate for their big break, Mia and Sebastian are just like everybody else. So many people come to LA believing they can make it. Very few actually do. It’s all Mia and Sebastian can do but fall in line like the rest of them. Mia works in a coffee shop at a studio backlot. She’s as close to her dream as she can be, but still so far removed. At an audition, Mia is giving her all, lost in the subjectivity of an emotional beat when an assistant barges in. Mia, no longer in the scene, is once more a struggling actress performing in a cramped room to a casting agent. In the hallway, other young red-haired starlets eagerly await their turn. Sebastian lives and breathes jazz and its history. He goes out of his way to get coffee just so he can be near his favorite club, a club that has ignominiously turned into a Samba Tapas joint. His scarce apartment is littered with memorabilia like a makeshift museum. Jazz is dying, and he’s taken it upon himself to preserve it. Such is the pervading existential crises symbolic of each character’s plight. They are both artists struggling to perform, struggling to be, in a make-it-or-break-it world that demands their talent but has no room for them. No one wants to hear jazz, but people love listening to the same Christmas music and are casually delighted by 80s-style cover bands. Sebastian has to make do because it’s the only way he can apply his craft. There are times when he can’t help himself and risks losing a gig if it means letting himself shine through for a moment. 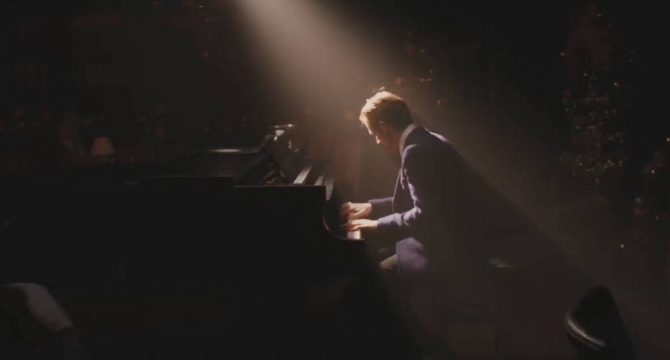 The film allows both Mia and Sebastian to get caught up in literal spotlights, distinctly exhibiting their passion, but also highlighting the loneliness of their pursuits. “People love what other people are passion about.” Mia knows nothing about jazz, but Sebastian’s passion is evident, something she rarely gets to show in the brief auditions that afford her very little room to express herself. When they get to know each other during a stroll across the Warner Bros. backlot, they have the space to do just that, their romance unfolding like a scene in a film. Or a film within a film. Mia points to a specific window across the coffee shop. “That’s where Humphrey Bogart and Ingrid Bergman looked out of in Casablanca.” To Mia that detail is everything. She stops and stares at every film shoot happening at every corner, always in awe, always on the outside looking in. At a screening of Rebel Without a Cause, Mia heads to the front of the theater in search of Sebastian. Sebastian looks up, momentarily spellbound by Mia’s face illuminated by the film projecting on screen. She is his cinema. It’s a moment of profound surrealism emphasized by the fact that it’s a scene in a movie theater (the film makes you feel as if they are in the theater with you, or vice-versa). As their love blossoms, the vibrancy of LA begins to fade, the stark reality coming into focus. Realistically, Sebastian cannot run a jazz club solely on passion. He needs money, as does Mia when she makes a liberating decision to put on a one-woman show. And she finds a unique way to frame it. “The whole world from your bedroom window?” Sebastian raves. They may be in love and in mutual admiration, but being in love does not magically solve our problems; it simply puts them into perspective. Sebastian joins a progressive musical ensemble and inadvertently surrenders to their vision. Whether he enjoys the music is irrelevant because every night he performs in front of rabid fans who show up in droves. Sebastian’s original plans are but a memory, gone in the artificiality of synthesizers and turntables. The horrified look on Mia’s face says it all. To compromise on your dream is worse than never having achieved it at all. 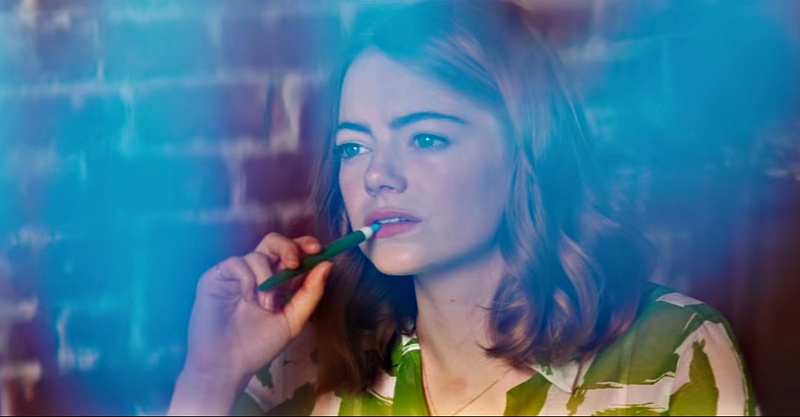 La La Land is ultimately Mia’s story. The film may get swept away with Sebastian’s exposition and performance (the only time we see Sebastian perform is when Mia is in attendance), but the film subjects us to Mia’s repeated rejection and heartache. When Mia gets a callback for a TV show, she walks in believing this is her moment. She barely gets out two lines before they cut her off. The dismissal doesn’t come bluntly, but more acutely with false formalities (“I think we’re good”). Mia can barely hold onto a smile as she quietly excuses herself. True heartbreak lies not in a spat between two lovers, but within Mia who tells herself that she’s not good enough. Humiliated, she heads back home to Boulder City (cruel irony, as her one-woman play was titled “So Long, Boulder City”). Alone in her room filled with hand-drawn theater posters, the full breadth of her ambition and its devastation is clear. She wasn’t striving for fame or fortune. She just wanted to express herself in front of people who actually cared to listen. She’s given that one moment. At an audition extended personally by a casting director, Mia is given a single instruction: tell a story. Her audition, which proves to be the audition, is all the more triumphant for demonstrating what Mia is capable of when she has an audience. We don’t need to be told that she got the part. We know she did. Where does that leave Mia and Sebastian? They do not fit in each other’s lives anymore, evident in the gradual parting of their ways (she would not accompany him on tour, he didn’t show up at her play). They met and bonded through their shared struggle. Their struggle, thankfully, does not last. Unfortunately, it means they can’t either. In the final, heartbreaking twist, the film forwards ahead five years when Mia and Sebastian cross paths once again. Mia and her husband find themselves drawn to a club. A jazz club, the logo reading “Seb’s” – the name originally suggested by Mia. Sebastian, then taking the stage, pauses upon seeing Mia, her face unmistakable in the crowd as she is featured on murals all over the city. The familiar tune Seb begins to play elicits a roaring flashback to their relationship and what could’ve happened had their lives turned out differently – a reminder that Mia has and always will be his cinema, Seb now dutifully serving as composer. There is an aching sadness to Sebastian’s dream. He is forever trapped behind a piano, playing the same music over and over. Their relationship is but another archive, another lush piece of history imbued in him (the epilogue deliberately slows down in the final notes, as if Seb is trying to prolong the dream of their romance). The film ends on a quiet note, Mia and Seb not quite running off together as we would hope. Instead, they share a brief, but heartfelt smile. How could they not? They played a role in each other’s lives, more importantly, their dreams. How often can we say that about the people in our own lives? It’s foolish to think that characters like Mia and Sebastian would risk themselves for the sake of their dreams, Mia having her heart broken after each audition, Sebastian holding out hope for his love of jazz. But wouldn’t it be more foolish if we didn’t risk ourselves at all? 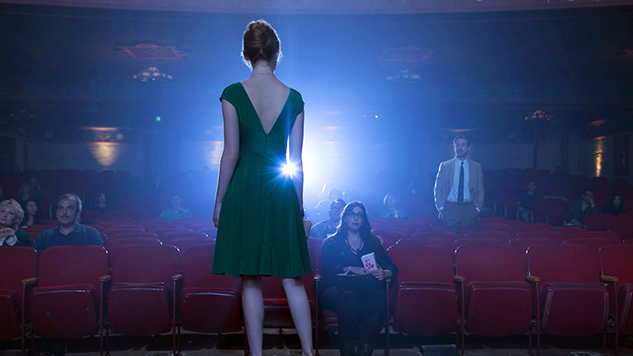 La La Land is an ode to the starry-eyed dreamers, the ending itself exemplifying that. Mia and Sebastian, of course, cannot go back in time. But it’s a fantasy that’s true to what they feel in the moment. So much of our lives happen in our minds, in the daydreams we lose ourselves in. Cinema provides exactly that kind of platform. Because cinema is an escape. It’s transportive, the emotion overriding the laws of human nature and causing everyone to inexplicably burst into song. In the cathedral of cinema, where fantasy and reality collide, who are we to decide what’s possible? La La Land is still in theaters courtesy of its Oscar bump.